At Yoga Kula we offer a range of classes to suit every student’s needs. Here is the simple way we categorise our classes so you can see what is going suit your needs. 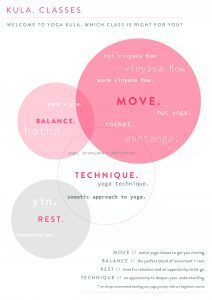 Our categories are; Move, Balance, Technique + Rest. Our move classes really get you moving and you will feel like you have worked out. A move class is great if you want to build strength alongside flexibility, you enjoy moving at a faster pace and you like to feel the heat during practice. Some of our move classes have a more fitness feel and some are more down the spiritual route – this will depend on the teacher so have a look at our teacher biogs to see which teacher best fits what you are looking for. If you are brand new to movement you might find an move class is too strong for you as a starting point. Our balancing classes are the perfect blend of action and rest. You will have the chance to move in a slower way with more time spent on individual poses. There will be time for meditation, relaxation and breath work to balance the body and mind. A balancing class is a good place to start if you are new to movement and want to take things a little slower. Our technique classes are perfect for those students who are newer to yoga or for students who are interested in taking more time to stop and refine their technique and skills. Our restful classes are perfect for those who need to take some time out of their busy day to learn how to relax and let go. If you are stressed at work, have trouble sleeping or want to practice in a slower, more grounded way a restful class would be a good choice. For new students, we always recommend our 6-week Begin courses, but if a course isn’t suitable it is possible to start beginner-friendly classes straight away. Don’t forget about our New to Kula 10 class pass. This offer is for new students only and is ideal for those students who want to get started on classes right away – this is a great way to sample the range of classes on offer over three months. New to Kula offer – an anytime class pass for £50.00. Purchase here. If you prefer to take a 6-week course these are available for the same price as the New to Kula offer. You may even want to take a 6-week course once you have finished your pass to build a deeper foundation or run a 6-week course alongside the New to Kula pass. We run several beginners courses at Yoga Kula as they are so popular and we want to support those who want to make a positive start to their yoga journey.